From a hopeful idea to a full-fledged nonprofit. Youth Ending Slavery began as a dedicated committee of five students from St. Mary's Academy in Portland. When Allison Nasson first learned about human trafficking during a Human Rights Club Meeting, she decided to do more than just discuss the issue; she decided to act. 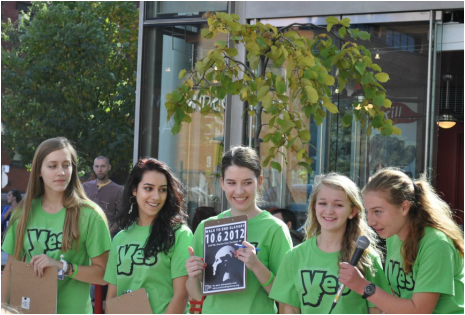 After raising awareness about the prevalence of modern day slavery within their school, YES hosted its first public Walk in 2012. The 2012 Walk to End Slavery attracted hundreds of people from the Portland community. Two years following this breakthrough event, that committee became an official 501(c)3 non-profit in the summer of 2014 under the leadership of former YES President Clare.